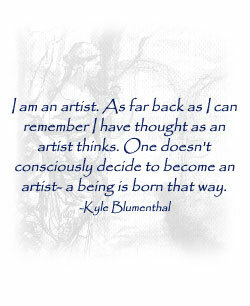 Kyle Blumenthal's life is steeped in art. From a very early age, she immersed herself in art books, art prints and art works. Her father was a sculptor and served as her first teacher. She experiences life as an artist, always looking at color, shadow and form in order to better portray them on canvas. Ms. Blumenthal has won numerous awards, had many shows and exhibitions and been favorably reviewed so many times that it is impossible to list them all on a single page. Her paintings of international conductors and soloists at Lincoln Center have won her critical acclaim. 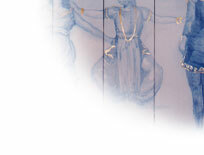 She has taken special awards at the Sodarco Gallery in Montreal several times. Her exhibits in the greater New York area and on Long Island have earned her praise from many sources. In addition to creating art, Ms. Blumenthal imparts her knowledge as a teacher and mentor, especially teaching students in junior and senior high school. Her commercial Illustrations have been used by Panasonic, CBS, ABC and New York News One among others. She has a firm grasp of her profession and has infused art into her very soul. My series "Hope" is inspired by spiritual visions I see before I open my eyes in the morning and at times in meditations. Birds in flight with outstretched wings, wild flower fields, sunflowers, gardens, Theatrical Installations, costumes and fantasy figures, all appear in the large paintings that comprise the "hope" series. I often portray unity in separation in my subject matter through the use of divided canvases. Regardless of what I am painting I use my entire body as I move across the canvases. I paint with oils on canvas and scrim and at times incorporate fabrics and light. The combinations of transparencies, translucent and opaque materials in my work reflect the ethereal and material.